The doctrine of eternal security is one of the cardinal doctrines of the Calvinistic system of belief. It is controversial doctrine, a doctrine that is hotly debated by its adherents and its opponents. Every Christian should closely and carefully test the truthfulness of the doctrine by comparing it with the teachings of the Bible. This book is written with clarity. 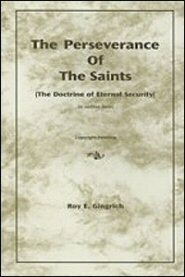 Mr. Gingrich has clearly presented the arguments for and against the doctrine of the perseverance of the saints and has convincingly presented his arguments for belief of the doctrine.